bird to identify the species conclusively (and for three of them to also determine age). Notes: Another great August week! Despite only three days of banding this week, we had another 140 new birds, representing a surprisingly diverse list of 38 species. Among these was another first for MBO, a Cape May Warbler. One of last week's new arrivals, Canada Warbler, showed up in force on Wednesday, with four of them being caught in rapid succession. 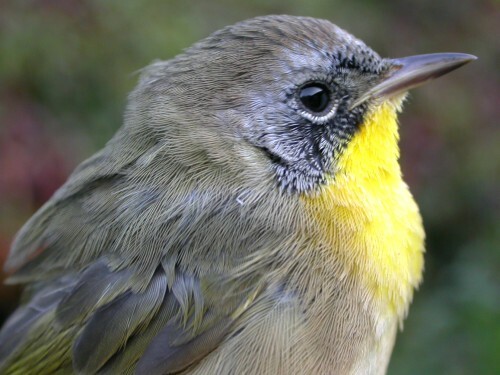 Overall though, the most common warblers for the week remained Yellow, Nashville, Tennessee, and American Redstart. Noticeable this week was a definite influx of flycatchers, as reflected in our photo quiz this week. 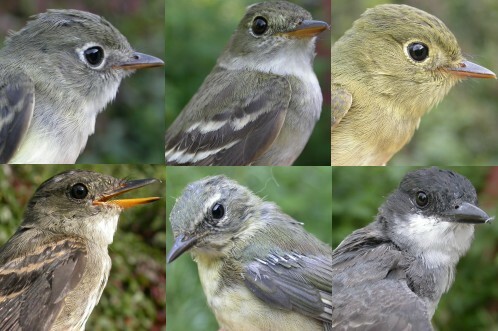 Our local Eastern Phoebes appear to have abandoned us, and migrants have yet to arrive, but we managed to get to six flycatcher species banded despite their absence. We were particularly pleased to get an Eastern Kingbird on Friday - they had been around in good numbers all week long, but showed a remarkable ability to avoid the nets. It's hard to miss their presence though - chasing each other, robins, jays, sharp-shinned hawks ... and getting chased on at least two occasions by Ruby-throated Hummingbirds! Both on Monday and Wednesday we had over 50 birds banded, but otherwise the mornings were quite different. On Monday we shattered our previous record for species banded in a day with 28 (previously 23), and added another 4 species through recaptures. It was also a somewhat painful day for us, as the birds captured included 6 woodpeckers, 4 Rose-breasted Grosbeaks, 3 Chickadees, and a viciously knuckle-pecking Baltimore Oriole. Wednesday we were back down to 22 species, nearly half of which were very nicely behaved warblers. New arrivals this week included a remarkably early Ruby-crowned Kinglet, a somewhat early Swainson's Thrush, and unexpected sightings of Northern Harrier and Wilson's Snipe. Other birds are hanging around for a while - we have at least two Tennessee Warblers that have lingered a week or longer, and have also recaptured Black-throated Blue Warbler and Black-and-white Warbler after a period of several days. However, the weather for the coming week is significantly cooler than it has been, so we are likely to see quite a turnover in the birds at MBO.